Merluvlee in Super Paper Mario. Merluvlee is a female character in the Paper Mario series. She always appears as some kind of a helpful fortune teller role, although the exact nature of her clues varies from game to game. According to Wonky, Merluvlee comes from a tribe that names people based on their profession, implying that every Merluvlee met may be a separate individual. It is possible that the aforementioned tribe is actually the Tribe of Ancients, of which Merluvlee expressly stated to be her descendant in Super Paper Mario. Merluvlee's name is a portmanteau of "Merlon" (therefore making her indirectly named after the fictional wizard Merlin) and a corruption of the word "lovely", which several characters use to describe her. 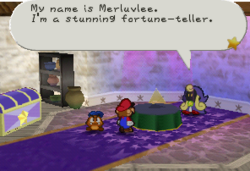 A Dryite in Dry Dry Outpost makes a typo in Paper Mario when he refers to Merluvlee as Merluvee, dropping the second "l". Merluvlee is revealed to be 25 years old in Paper Mario: The Thousand-Year Door by an e-mail sent to Mario. In Paper Mario, Merluvlee lives in a house on Shooting Star Summit, with her brother Merlow. Throughout the game, many characters comment that she is the most beautiful woman they have ever seen. Somewhat comically, the player is never allowed to see her face, because she always wears a hood. She is also notable for being the owner of the companion to the mysterious chest in Peach's castle. According to a gossip-loving Toad near Tayce T.'s house in Toad Town, one of Merluvlee's hobbies is cultivating bonsai trees. For one of Koopa Koot's favors, Mario is requested to retrieve Merluvlee's autograph. The reward for doing so is three Star Pieces, making this one of Koot's more lucrative favors. She can predict the locations of Star Pieces, Badges and Super Blocks. For the Star Pieces, she charges 5 coins, and can only predict 63 of 160, namely those found in the overworld instead of owned by characters. For the Badges, she charges 20 coins, and can predict all but the Power Jump which is owned by Goompa. For the Super Blocks, she charges 30 coins, and can predict all of them. For Star Piece predictions, see List of Star Pieces in Paper Mario. For Super Block predictions, see Super Block § Merluvlee's predictions. For badge predictions, see List of badges in Paper Mario. In the sequel to Paper Mario, Merluvlee lives in a house on the east side of Rogueport Underground's main square. Though she can no longer see the locations of badges, she can still tell Mario where Star Pieces are hidden, and she has gained the ability to locate Shine Sprites, and she can tell Mario what to do to progress generally in the game. She charges five coins for Star Pieces, ten coins for the locations of Shine Sprites, and varying amounts of coins to hear the next destination. Once again, characters comment on her beauty, and once again, the player never sees her face. 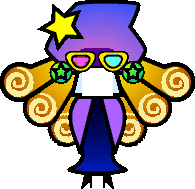 In Super Paper Mario Merluvlee lives in Flipside. Here, she is Merlee's rival and has been ever since they were classmates. They share the same theme music, which is titled "The Road for the Lost". Merluvlee wears 3D glasses and has a chant very similar to that of Queen Jaydes. She can be paid 20 coins to give fortunes. Once paid, she will perform a dramatic chant and give the player a hint as to what they should do next in order to progress. Merluvlee is part of a long sidequest to get a new crystal ball for Merlee. She needs a training machine (which looks like a Nintendo DS) which belongs to Bestovius. When Mario and co. get this for her, she will give Merlee's Crystal Ball to Mario and friends. The Catch Card for Merluvlee may be found in a pit in the outskirts of Flipside, alongside the Merlon card. Card Descrpition: This fortune teller with a wild laugh lives in Flipside. She uses the stars to read your future. Sorta. In Super Paper Mario, Merluvlee mentions that she and Merlee are 'even' when she gives the Crystal Ball - this may serve as a reference to the original Paper Mario, in which Mario had to give Merluvlee a crystal ball from Merlee. Misutēru Pun on mystery and Merlon's Japanese name, Deāru. German Merlieblich lieblich means "lovely"
Mòlùlì From the English name. This page was last edited on March 5, 2019, at 08:01.